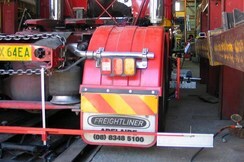 All Transport leads the way in Heavy Transport Crash Repairs. Our property is approximately two and a half acres and the workshops cover more than an acre. 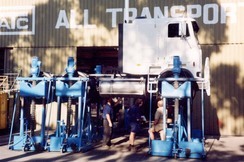 We can accommodate over 30 trucks, buses or trailers. Facilities include; 3 chassis straighteners, 3 overhead gantries, 3 spray booths, extensive specialised equipment and a truck wash.
Click on your area of interest or scroll to view all. And to see the results of our work view Before and After. 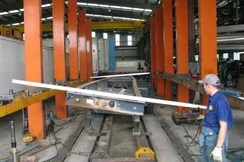 Images: Chassis being repaired and then checked with a laserliner. 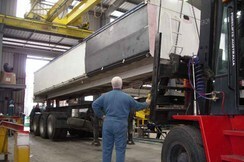 All Transport has three custom built chassis straighteners all equipped with overhead gantries. 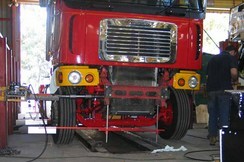 The largest chassis straightener is unique in Australia and can repair units up to 18 metres long and 5.2 metres high, using 10 to 50 tonne porta powers. 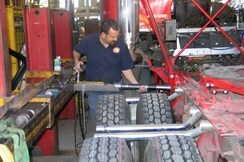 During the repair process owners are kept informed and are welcome to inspect their vehicle. 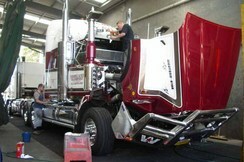 On completion a detailed checklist is carried out, and major rebuilds are road tested by our mechanics. 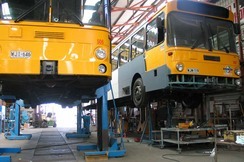 If required we facilitate the clearance of ‘Accident Defect Notices’ with the Department of Transport. 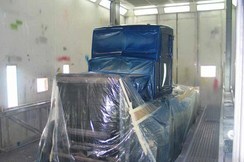 Many vehicles leaving our spray booth have gone on to feature in leading truck magazines. The secret is in the preparation. If the preparation isn’t first class, the finished job won’t be up to our high standards. Our main spray booth has been custom built. 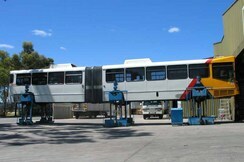 This unique booth is natural gas fired and can accommodate vehicles up to 22 metres long. The booth is downdraft and features a push button elevating full surround platform, allowing for a safer and more efficient paint job. 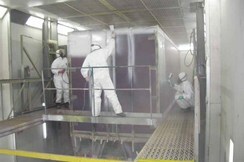 We also have two additional downdraft spray booths. 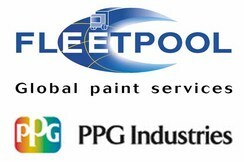 All Transport is officially appointed to PPG Fleetpool, providing custom paint specifications for corporate organisations across Australia. PPG is a world leader in automotive coatings and draws on the best technologies from around the world. 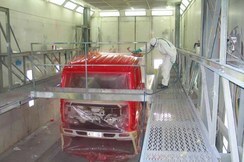 All Transport can also source an owners preferred paint, including Sikkens, DuPont, Protec, Glasurit and more. Vehicles are finished with professional signwriting, owners are also welcome to nominate their own signwriter. When painting new or rebuilt vehicles we can work with your livery supplier or help you with your own design ideas. 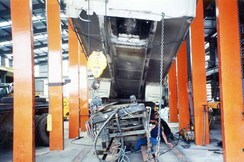 Rolled tipper being repaired in the chassis straightener (crush). Both the tub and chassis were repaired. 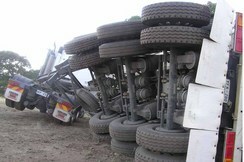 Top row: Accident scene, Badly twisted chassis, Front and rear straight edges show the major distortion on the chassis. Next row: The repaired tub and a new hoist are refitted to the repaired chassis (ready to paint), Repaired chassis, Testing completed unit. 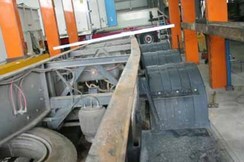 After repairs, tip over axle trailers are driven onto the test bed area. The vehicle is then tested well beyond field practice to ensure it is fully operational. 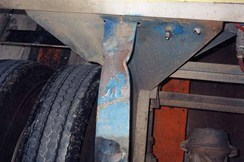 The owner of this unit was advised by another repairer that his only option was to supply a new rear section of chassis. However, we assured the owner that the chassis could be repaired. Saving the owner time and many thousands of dollars. Image 1: Another repairer left this unit 200mm out of square. The white lines marked on the image show how far we had to twist the unit to correct the original repair. 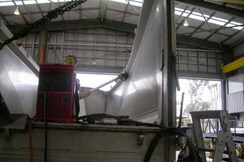 Image 2: Tub with a 300mm bow, repairs are being carried out using our Custom Built Long Stroke Porta Power. 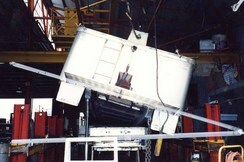 Image 3: A tub and chassis being repaired without the cost of separating the unit. Note the chain on the bottom of the tub allowing for free movement and twisting while carrying out chassis repairs. 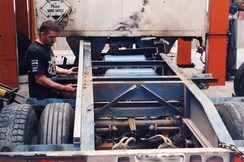 Some repairs do require the tub to be removed from the chassis. Our large workforce of over 40 employees plus subcontractors ensures that we have the flexibility to work in with your needs. 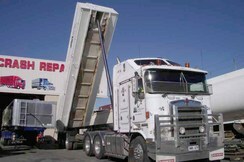 Our office complex also includes a Conference Room and Truckies Rest Room. 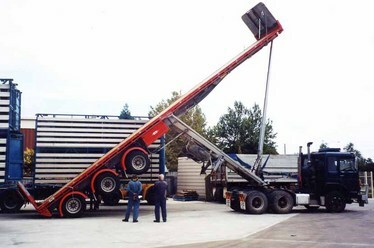 For serious accident damaged vehicles inspections are carried out using Hyweema Lifts. 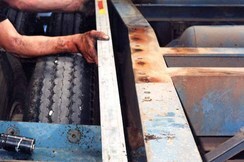 These lifts allow for a thorough inspection of damaged or worn parts. Our ten Hyweema lifts allow us to lift more than one unit at a time. This facility is far more effective than using a pit or body hoist. 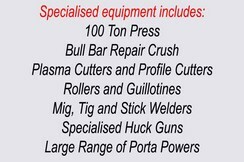 Extensive additional equipment includes several forklifts, ranging from 1 ton, up to 10 ton. 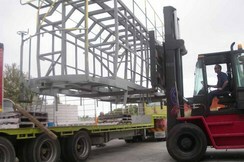 Forklifts are used to off-load damaged units and assist with repairs. 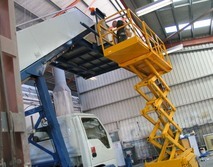 Also shown here is our scissor lift being used to refurbish a mobile airport staircase for the RAAF. 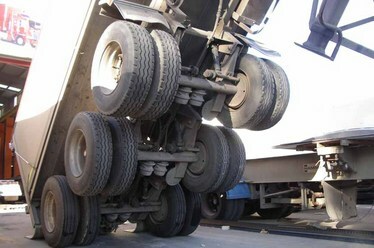 After a major accident, vehicles are often covered with debris or waste from the load. Vehicles are washed to assist with identifying damaged parts and oil leaks (Image 1). 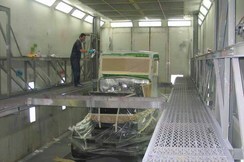 The facility is also used to clean vehicles before delivery (Image 2). This purpose built facility was designed to have minimal environmental impact and has proudly been used by environmental officers as a demonstration site for best environmental practices. The facility operates on our own harvested rainwater, which is purified before entering the sewer system. The steel grates are designed to capture all debris as the waste water is drained very slowly across the gradient floor. This allows for the maximum separation of solids before entering the sump and then the oil separator. 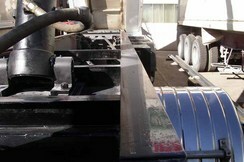 The trap is regularly cleaned out and the waste oils are sent for reprocessing. 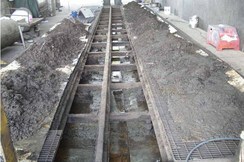 Once a year the grates are removed and all of the captured debris is cleared (Image 3).